I have weird children. 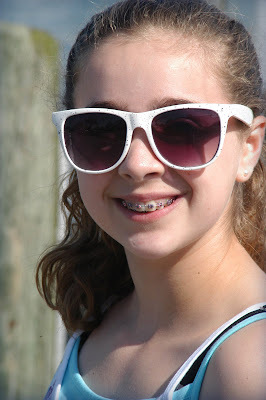 Back in my day….my youth, braces were a necessary evil for many teenagers. Nobody wanted them, though most were probably grateful adults later on. Orthodontists were sadists, and even Marsha Brady had an episode devoted to hers. Her braces, not her orthodontist. Don’t know who he was. Didn’t even get a credit at the end. My girls wanted braces. Especially Brooke. Not because she wants perfect teeth. She loves the glam. 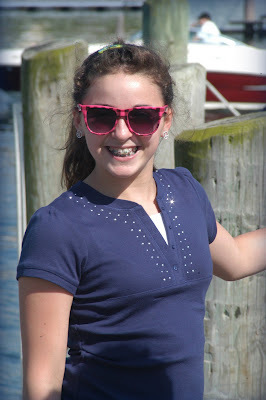 She sprung for designer braces with colorful doodads. Mouth bling, she calls it. Did I say SHE sprung for…? Ha. I sold off two acres of the family farm to pay for those. Thankfully, it wasn’t my farm. Boy, are they gonna be mad. But they won’t ever find me. I sold it under the name Marsha Brady. I was speaking with someone recently who asked me if I had ever heard of fainting goats. I thought he was kidding (no pun). He said, for real....when they get scared, their defense mechanism is to faint...something akin to playing dead. I thought this was a fairly ineffective counter measure to an attack. Something Darwin should be able to clean up in a single generation. I envisioned finding a herd of such animals...myself armed with a video camera for what I'm sure would be the next YouTube hit. Sneaking up to the herd. And then jumping up and down screaming, sending these little beasts to the ground en masse. But then the vision changed. I imagined I was duped. 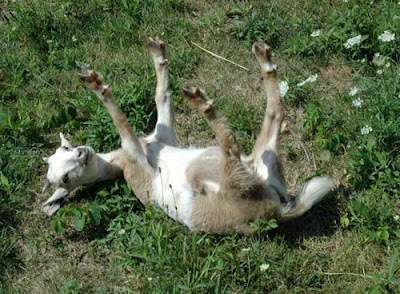 There is no such thing as fainting goats. It was a ruse. I was misled to believe I'd be startling a bunch of defenseless animals into horizontal submission, only to discover that the startled herd would turn on me, en masse, and drive me screaming over the fence....captured on video like a cross between a Benny Hill sketch, and the Blair Goat project with closeups of my face as I run away in terror. And naturally, this would be a smash hit on YouTube. Although it has rained for 26 out of 30 days of June here in New England, I still long for a good ole fashioned summer thunderstorm every now and then. Truth be told, it's an addiction. I always want it to thunder. If there's a storm nearby, I'll drive to it. Storm chasing is a hobby, and a passion of mine, though today I may have gotten more than I bargained for. While driving through the Adirondack Park north of Saranac Lake heading for a wedding shoot in Massena, I encountered an awesome sight. 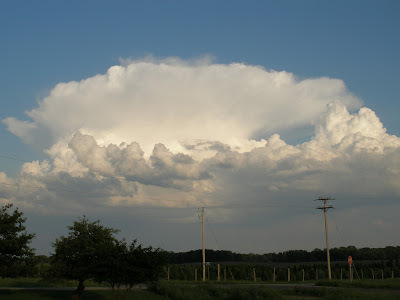 A full fledged, textbook thunderhead, complete with anvil top sheared by the jet stream racing by at 150 mph at 40,000 feet. I could see the plume of hail erupting out of the top and wondered what I'd do if it suddenly starting hailing on me and my beloved Mustang. In the absence of any man made shelter out here on rural route 86, I reasoned, should the need arise, I'd veer off the two-lane blacktop into the woods hoping the leafy trees would offer sufficient cover. I tuned the AM radio to a place on the dial between stations to listen for the signature lightning static of a nearby storm. I can usually gauge the intensity of a storm by the gap between static bursts on the radio. Less than 10 second gaps usually means it's a pretty active storm. The gap at that moment was about two seconds. Sometimes less. Sometimes no gap between static bursts. I smiled nervously. As I got closer, and the road turned me directly into the storm's path, I saw a huge bolt of lightning come down straight ahead. It was thick and purplish-white, and very bright. I counted to 4 before I heard the boom of thunder. That was pretty close. The next one was closer. Much closer. What is it that makes a car a safe place in a thunderstorm? I used to think it was the rubber tires. That's a myth. They are as insulating as a pair of rubber soled sneakers. It is the metal structure of the car that directs the charge around the occupants. I thought of this as I looked up at my convertible canvas roof. Stylish, yes. But about as much lightning protection as a hat. Then came the hail. Big. About the size of chick peas. Only they were coming down all stuck together in clusters as big as golf balls. Very loud! Suddenly I was not thinking about the lightning. I had just enough reaction time to swerve right onto a tiny dirt road that led immediately down a steep embankment into the woods. It was a very rough road with big ruts and holes. I skidded to a stop with my ABS vibrating frantically. The leaves and twigs overhead were raining down onto my hood, and the hail was thunderously loud on the roof. I was sure my car was going to look like a dimpled golf ball in a few minutes. The hail piled up quickly on the ground. It was an inch or so deep in less than a minute. Amazing! I kept praying it would quickly turn to just rain. It was as dark as midnight and the lightning was vivid. I could see debris blowing across the road in my rear view mirror each time the lightning flashed. I hoped the leaves and twigs landing on the car meant they were taking the punch from the bombardment of hail, and what I heard hitting the car was only a fraction of the intensity above the trees or on the roadway. Then the hail stopped. It was deafeningly silent. I had to get out to clear the windshield of twigs and small branches before I dared use my wipers. I wondered if I'd be able to get back out of the hole I had made in the forest back up to the road. My beloved Mustang climbed like a champion. Once again en route with the sky brightening ahead, and midnight behind me I decided to be more careful what I wished for. Here is a photo. I was a little too busy to unpack the camera, but this is very much what it looked like.